Hello! I hope that you’re all keeping your valuable digits warmly wrapped around scissors and coffee cups and enjoying a creative sit down- welcome winter! Indoor spaces with outdoor views are my favourite zine making conditions, so I am looking forward to a burst of productivity during the winter weekends ahead! June has come and almost gone – but we have one A Zine Thing teen zine making workshop at Northcote Library (Thanks to Darebin Libraries for asking us to facilitate this event) on the 27th – the perfect pre-IZM warm-up! and make sure you keep an eye out on our facebook page to see what else AZT get up to this July. As I posted late in December on our facebook page, this year has been a wonderful mess! Indeed 2015 has proved to be the necessary stepping stone in the direction we would like AZT to take. More workshop series, re-launch of our upcycled community project and update our distro stock for starters – we still have a lot of work to do! I would like to again mention that we’ve met some pretty amazing people at workshops and zine fairs across Australia (FOTP & ZICS the highlights per usual) THANK YOU to all of you that have been involved in our events and projects in any way – we appreciate your enthusiasm and support! While we are still in a period of transition we can confirm we will be running zine workshops during the first week of the school holidays through Yarra City Libraries (check fb events) and have plans for more local involvement this upcoming International Zine Month (aka July). I am optimistic and excited to think about the possibilities that 2016 may hold for us zine-wise, I hope you feel the same way too. 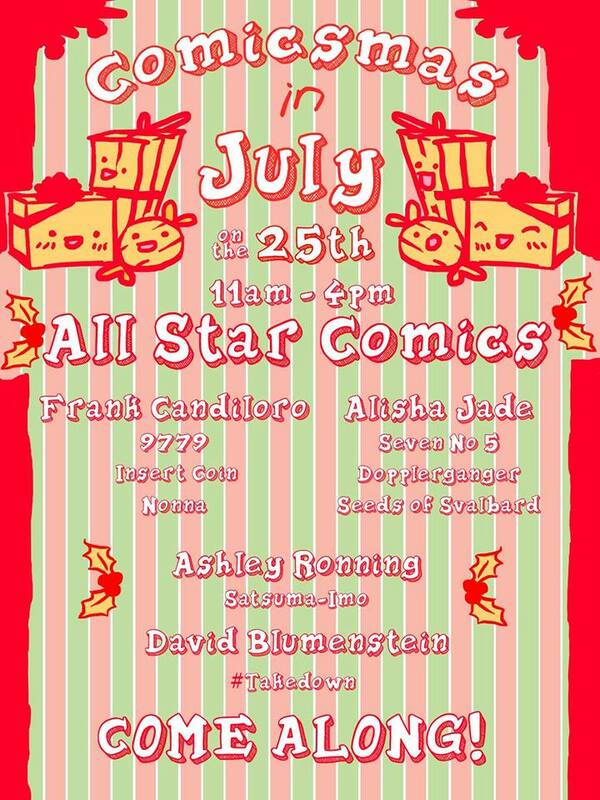 Yesterday I headed into the city with my family to visit to All Star Comics for an in-store indie launch-event ‘Comicmas in July!’ that featured new works by David Blumenstein (ping Squishface), OH MY! Alisha Jade, Frank Candiloro and Ashley Ronning from Caledra Press. Arriving early meant we had an opportunity to chat with the creators briefly however we all became quickly distracted by an adorable pug who had the same idea. Who doesn’t love an over excited puppy?! So albeit a brief encounter it was a wonderful way to begin a weekend; seeing these friendly local creators celebrating their latest projects and sharing stories. I have read lots of locally created comic and zines over the years, and more recently I’ve been thinking about how Australian creators have a unique ability to interpret events or approach topics that conventionally minded people may find uncomfortable or emotionally confronting, and without compromising the integrity of the content and point, somehow keep it light enough for any reader to process. I really like that. Hey – it hasn’t escaped me that it is International Zine Month! Although I may have been somewhat quiet on social media in recent days (busy reading cool comics etc..) there’s been zine action behind the scenes and I will share a #IZM2015 round up/highlights post upon its conclusion – so stay tuned! 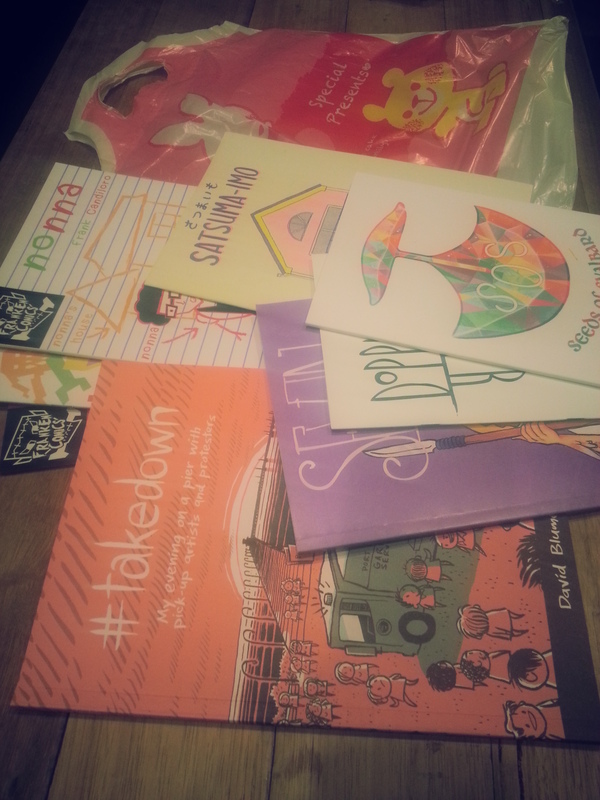 In the meantime, stay warm + read comics + zines! 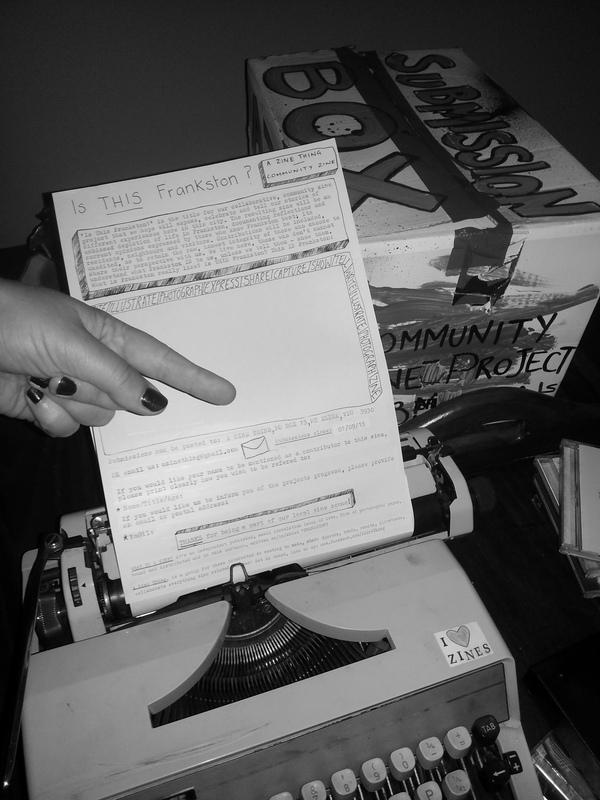 Our ongoing local Community Zine Project #IsThisFrankston? has gathered pace with a new submission form release and plans for a 2nd printed zine to be launched at the end of 2015. Look out for this form in and around Frankston and watch this space for updates. A Zine Thing has finally made the move from social media platform to its very own webpage! From now on all our upcoming workshops, events and newly stocked items will be announced here on our blog! Exciting times!